Fans of the 1950s classic movie, Born Yesterday, starring Judy Holliday and William Holden, will find much to enjoy in Guthrie Theater’s version, which is based on playwright Garson Kanin’s original Broadway play. Born Yesterday at the Guthrie is an amusing, well-acted romantic comedy and political satire, whose indictment of congressional corruption still resonates. 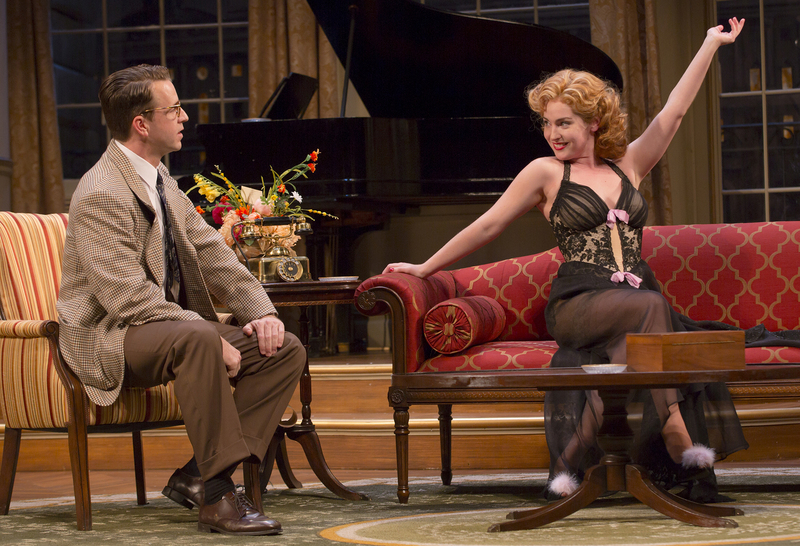 Alexis Bronkovic, in her Guthrie debut, captures perfectly the sashaying sexuality and ditzy-ness of Billie Dawn, ex-chorus girl and girlfriend of Harry Brock (Jeff Still), a corrupt junkyard kingpin from New Jersey. Brock takes up residence in a posh Washington D.C. hotel hoping to buy a few politicians who will pass laws favorable to his business. Helping Brock in this effort is fallen lawyer Ed Devery, played by Mark Benninghofen with a convincing mix of irony and humor. Benninghofen delivers a wonderful performance and some of the best lines of the play, including the closing speech. Brock realizes early on in the play that he needs to smooth Billie’s rough Brooklyn-accented edges so she doesn’t become a liability in Washington’s tough social scene. He hires an idealistic journalist, Paul Verrall (John Patrick Hayden), who agrees to tutor Billie in hopes of uncovering a scoop on the mobster. Billie and Paul’s mutual attraction is immediate (“I have a yen for ya,” says Billie) and grows deeper as he instructs her in grammar and political theory. She discovers she wants more in life than two mink coats and begins to stand up for herself. For his part, Paul wants to change the world by revealing the corruption of Washington and the apathy of the voting public: “Don’t care-ism is Satan’s key to success.” After a few rousing speeches and a plot twist or two, Paul and Billie eventually prevail over Brock the bully and political cynicism. It deserves mention here that Garson Kanin was among the many artists later bullied by Sen. Joseph McCarthy and the House Un-American Activities Committee. The play offers light comedic fare and follows Guthrie’s season re-make of another classic romantic comedy, Roman Holiday, which was also on the McGuire Proscenium Stage and directed by John Miller-Stephany. Set Designer Todd Rosenthal deserves recognition for a beautiful hotel suite set that featured the U.S. Capitol building in the background.